Since Jennifer wrote this piece below, the choir has gone from strength to strength: we are now 48 members strong, just 3 years ago the number was around 30. This addition to our ranks has given us a very rich sound; Martin has always said that he will continue to be our musical director as long as we improve from concert to concert and up to now that appears what we seem to do! If you haven't heard us yet make sure you get to our next concert - it's a great night out; hotpot supper, raffle, and bring your own drinks, what more could you ask for! Christmas concerts have become a regular feature with RLC, singing locally, at golf clubs etc. Great for getting into the Christmas spirit, singing some rather unexpected songs along with the usual songs - well worth seeing and hearing! Long behind us are the days when I started a small singing group in Mothers' Union - labelled by our late friend and supporter Tony Hemingway as the Mothers' Union Glee Singers - or MUGS for short! Then, with the formation of 'Churches Together in Rainford' we invited ladies from the other churches in the village to join us for joint services and informal meetings. This group formed the basis for what became the Rainford Ecumenical Ladies' Choir. When Eric Fazakerly took us on as musical director, he organised us to lead the singing at a Mothers' Union Songs of Praise Rally at Orrell Rugby Union Club, as well as the Diocesan Festival in Liverpool Cathedral - and what a wonderful experience that was! Later, when Eric felt the time had come to finish, we were fortunate to acquire the services of Martin Weston as our musical director, and the rest, as they say, is history! He has changed and developed the choir beyond all recognition. Whilst it is true that we have built a strong reputation singing at local weddings and funerals, we are now in possession of a vast repertoire of widely varying concert music. We seem to have established a pattern of 2 concerts per year in Rainford Church Hall. The October concert is always aimed at raising money for the village Walking Day. We have also had the pleasure of singing with the Rainford Band at their Summer concerts in the barn at White House Farm, as well as charitable concerts at Corpus Christi, at the United Reformed Church, and St Helens Parish Church with Parr Band. The choir has also performed at many charitable and private functions in the surrounding areas, and we now boast many members from outside the village. When I took over as musical director of the choir in 2002, I remember our first rehearsal spent practising Mozart's 'Ave Verum' in readiness for the Mothers' Union Deanery festival. Later that year, we would perform our first concert - singing mainly in 2-part harmony. Our repertoire consisted of some sacred items, plus some old folk songs such as 'Fairings' and 'Scarborough Fair'. We were accompanied by our wonderful pianist Ruth Birchall. We received a big ovation for 'Bridge Over Troubled Water', which was a challenging item at the time, but would become part of our staple repertoire over the years. My ambition for the choir was simple - to improve the quality of the singing, and to provide the choir with a repertoire that was both diverse and enjoyable. We quickly added pieces such as Sting's 'Fields of Gold' and 'If My Friends Could See Me Now', from the musical 'Sweet Charity'. Our singing became predominantly 3-part harmony, with even elements of 4-part harmony at times. As our accompanist's health sadly deteriorated, we began to use orchestral backing tracks to accompany us at times. And when Ruth passed away, rather than set about the impossible task of replacing her, we used technology instead. Now we perform predominantly with backing tracks, although I might hop on to the piano myself every now and then! I've been really proud of the choir over the years. Their constant improvement has meant that our concert repertoire has become ever more diverse and challenging. Audience feedback from our concert performances is always really positive too. If you watch us, you are at the very least guaranteed an entertaining evening. 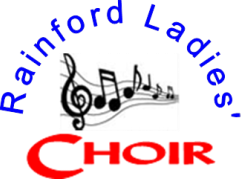 Our recent name change - from the 'Rainford Ladies' Ecumenical Choir' to purely 'Rainford Ladies' Choir' - has enabled us to harness further the power of the internet with our website and social media pages, and move forwards as a choir. Meanwhile, the choir continues to go from strength to strength vocally, with up to 20 exciting new pieces of music added to our repertoire each and every year. It's a great time to be a member of a choir - it is a really stimulating experience that I would heartily recommend to anybody!